Even for users authorized to file documents electronically, some documents may not be e-filed, and must instead be presented to the Clerk for filing or lodging in paper format. A list of such documents is set forth below. 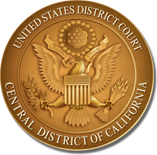 If you are a pro se litigant who has been granted leave to file documents electronically in a particular case, the following documents MAY NOT be e-filed using the Court's CM/ECF System; however, check your assigned judge's Procedures to find out if you are required to submit any of these documents by email. If you are an attorney, these documents MUST be e-filed using the Court's CM/ECF System if they are subsequent documents filed in an otherwise un-sealed, public civil case. Case-initiating documents filed under seal or with an application for leave to file the case under seal, and subsequent documents filed in sealed cases, must be presented to the Clerk for filing or lodging in paper format. See amended Local Rule 79-5.2, effective 12/1/2015.